Walk into my abode anytime and you’ll see that I’ve more or less won the war on clutter. Four people in a two bedroom apartment can make anyone an expert on organization and conservation of space. Beds are made, dishes are done–even the unruly flotsam of toy parts and pieces, booty from a hundred Happy Meals, can be swept away in an instant into a beautiful wicker basket, tastefully chosen to match the living room decor. But should you chance to wander through the hall and over in the direction of the laundry room, expect to be violently intercepted. I can’t let you open that door. If anyone ever sees what’s in that room, I’m ruined. Gone forever is my (admittedly slim) chance of ever being compared to the Proverbs 31 woman. No one who has seen the truth behind that door could ever again think of me as someone who even remotely has it all together. And what horror, you ask, could possibly lie in wait in the dark recesses of my laundry room? I’ll tell you: seventeen loads of perfectly clean, irreparably wrinkled, unfolded laundry. Seventeen. That is not a number I made up for shock value. That is the actual number of times I filled up my washer with dirty clothes, washed them, moved them to the dryer, dried them, and scooped them out into the laundry basket. Or, more accurately, onto the laundry basket. Seventeen loads of laundry do not, strictly speaking, fit into one laundry basket. They are piled up, load upon load, in an ever-growing, precariously perched monument to my domestic ineptitude. A monument which, even now, is actually touching the ceiling of the laundry room. That’s my cue, you see. When the laundry touches the ceiling, it’s time to fold it. I have always done laundry this way. I suppose in the beginning, when Paul and I were first married, there was a rationale for it. We didn’t have our own washer and dryer, or even a car, so laundry would be carefully saved up over a few weeks before borrowing a friend’s rig for the day-long excursion to the laundr-o-mat. It was romantic then; we would bring books of poetry and a picnic and coo lovingly to each other over the vibrations of a dozen simultaneous spin cycles. 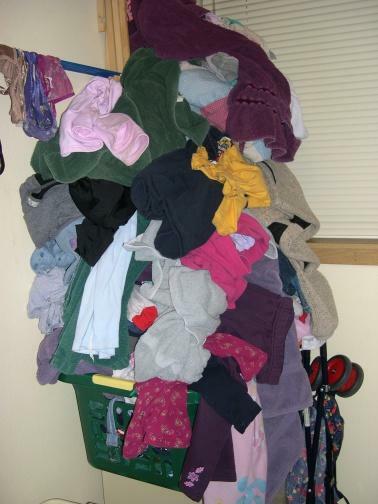 Ten years later, with my own laundry room and no excuses, I am still waiting till the last pair of underwear (most of which I bought in an attempt to prolong the inevitable) disappears from my drawer to do anything about the laundry. Sure, I’ve made resolutions. Dozens of times, in the middle of a marathon sock-matching session, I’ve sworn to myself to fold every load the moment it emerges, warm and unwrinkled, from the dryer. But then the kids call to me, the crisp fall day begs me to join in the dance of leaves, and every single thing in the world seems more important than an empty laundry basket. Days turn into weeks, and soon the monument reaches skyward once more. So I go back to the old way. The me way. And, finally, I think I’m okay with that. You probably don’t want to hear about a bachelor who micromanages his admittedly small laundry load (normal wash, switch to gentle wash during rinse cycle, medium dry, remove cotton/poly blends first, then each cotton item as it reaches dryness). I have two hundred pairs of dirty uinderwear, that remain always dirty, while I have seven pairs that I wash once a week. WTF? I have no advice when laundry comes into the picture…I just sort of sit and stare in the other direction. Good point–tackling a full-bladdered person may be good for a laugh, but it’s bound to result in even MORE laundry. I’m with Kathy on this one…it’s just better for me to keep my front door (and back door and laundryroom back door) closed to anyone that dares attempt to enter. My entire house can be summed up by your laundry room. Any mother of 3 is bound to just give up when it comes to keep the house clutter free & clean, right?!?! Please say yes – even if you don’t agree.